The Wasi is a zaftig goddess' dream with its welcoming 90" bustline! 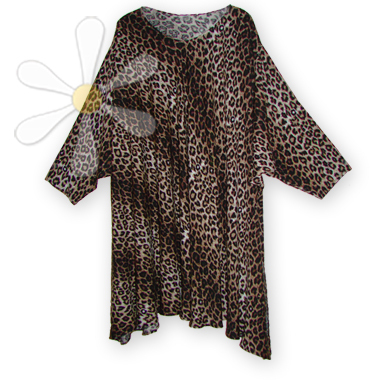 This oversized, soft-as-a-kitten tunic is all sorts of gypsy wild: it has a full and s-w-i-n-g-y shape -- the sides widen out FOREVER towards the bottom, and there are 12" comfort slits on the sides. Can you spell f-a-b-u-l-o-u-s? You can cinch it at the waist with a matching scarf or a wide Moroccan belt, or let it drape lusciously over your favorite pants or skirt. Either way, it's a beautiful start for the perfect goddess outfit! For full details see the regular WASI page.